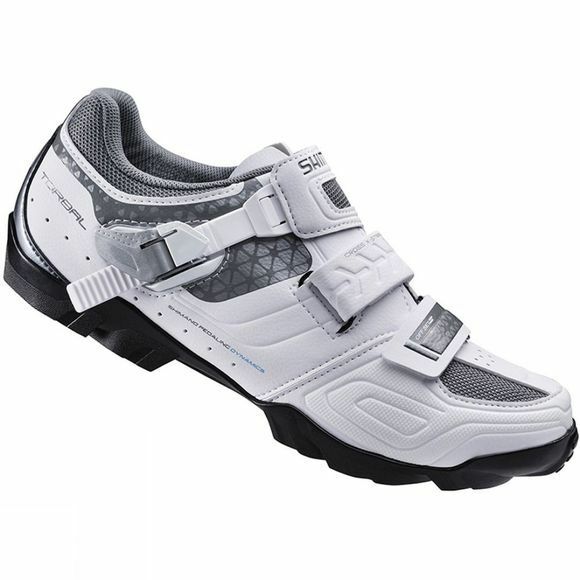 The Women's WM64 SPD ultra-versatile off-road sport shoe by Shimano can be used for a range of sporting activities from racing cross-country or on a casual Sunday ride. Glass fibre reinforced polyamide TORBAL midsole gives pedalling efficiency but also excellent control thanks to the rear foot torsional flex. Additionally, it has an easy to use secure fitting micro-adjusting buckle strap is backed up by two offset and cuttable Velcro-style hook-and-loop closure straps and the new Cross-X strap design that prevents pressure points.